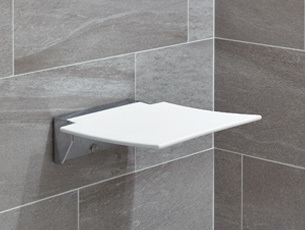 Accessible bathroom fixtures and fittings can be designed flexibly using the mobile solutions from HEWI. Accessible bathrooms are very often needed at short notice – with mobile shower seats and hinged support rails any sanitary room can be adapted quickly and with very little effort to the individual needs of the patient. The mobile solutions are latched into a fixed mounting plate as and when they are needed. 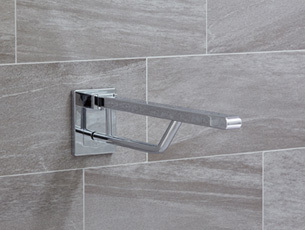 The particularly easy, toolless installation allows the care or cleaning personnel to add the mobile seat or mobile hinged support rail to the bathroom when it is needed. If the mobile solution is no longer required, a discreet cover conceals the mounting plate. Hinged support rails provide additional safety and support for persons with limited strength and mobility. They provide comfort and stabilisation in all areas of the sanitary room – whether at the washbasin, the toilet or in the shower. The hinged support rail is latched into a permanently installed mounting plate and can be just as easily removed if it is no longer required. To this end a spring underneath the rail is released with light finger pressure and the hinged support rail is lifted out of the mounting plate. The mounting plate is then concealed with a cover. The mobile hinged support rails offer the same functionality as permanently installed hinged support rails. Mono versions and duo variants with a second gripping level are available to choose from. A large choice of materials (chrome, stainless steel, polyamide and WARM TOUCH) and designs enables the mobile hinged support rails to be integrated into the bathroom ambience. 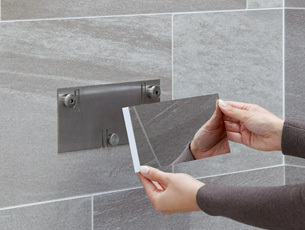 HEWI shower seats offer special comfort and convenience in the shower. Seating also increases safety significantly. When needed, the mobile shower seats are simply latched into the permanently installed mounting plate. The shower seat is additionally secured with a knurled screw. To dismantle the seat the screw is undone and the shower seat is unhooked effortlessly from the mounting plate. The mounting plate is then concealed with a cover. The mobile seats can be folded up to save space. The seat surfaces are made of glass-fibre reinforced polyamide and are optionally available in white or anthracite grey. The comfortable seating has a weight capacity of up to 150 kg and is available in different sizes.